In My Mailbox was started by The Story Siren as a way to showcase all the books she receieved on a weekly basis. It has since spread across the book blogging community, and I'm so excited about what I've recently received that I want to share with all of you. This week has been one of those really awesome mail weeks. You know what I mean - a week where you come home every day to find a lovely package stuffed haphazardly in your mailbox or a box sitting on your porch. That has been my week. These are the lovely things that are now stacked precariously on my desk. A few weeks ago, I reviewed Mary Ann Loesch's Nephilim as part of a blog tour. Ms. Loesch was kind enough to reach out to me with a copy of her writing group's collection of short stories. I'm always looking to support local authors, so I gladly accepted and hope to have a review up around December 5. My excitement at receiving this book was extreme. This is the first book I requested from one of the big publishers that has arrived on my doorstep. Thank you so much to HarperCollins for sending it my way. Monsters of LA will be part of a blog tour hosted by Pump Up Your Book on December 8 & 9, so thanks to them and Lisa Morton, who included a nice note and bookmark for me. I don't read a lot of non-fiction, but I am very much an anglophile geek so I think this will be a fun read that I will then share with my even bigger anglophile geek sister-in-law. Thank you to HarperCollins for sending this my way as well. This book looks like so much fun. Thank you to Dana at Zombie Girl Shambling for sending it my way. 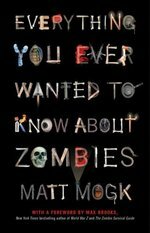 A million thank yous to Tabitha at Mission to Read for sending me what will inevitably be a creeptastic zombie apocalypse novel. Thank you to Cindy for sending me both The Alias and an e-copy of her book Watched. Looking forward to reading both. Thank you to Laura for this e-copy of her novel Brightwing. Looks exciting! And now I am officially doubting my intention to go to the library on Monday. I think I have enough to read right here at home. I really need to stop entering contests.